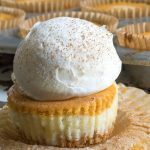 Pumpkin Cheesecake Cupcakes, vanilla and pumpkin cheesecake swirled in cupcake form with graham cracker crust. Place all the ingredients for the crust in a medium sized bowl and mix together until combined. Evenly distribute crumbs amongst 2 lined muffin tins (24 in total). Pack down crumbs with fingers, set aside. Make sure the cream cheese is at room temperature and soft by letting it sit on the counter for a couple hours. Beat this with a hand mixer until fluffy then add the remaining ingredients except for the spice and the pumpkin puree. Beat this until thoroughly combined and scoop out about 1/2 of the mixture and set aside. Add the pumpkin puree and spice. Mix until combined. Fill each of the liners half way with the vanilla mixture, saving just a tiny amount for the pretty swirl design on top (optional). Fill them almost all the way to the top with the pumpkin mixture. Place two tiny dollops of the vanilla mixture on top, and with a skewer, drag the orange through the white to create a swirl effect. Bake for 18-23 minutes, until the cheesecakes are a teenie tiny bit jiggly. Let sit on counter until cooled completely. Top with whipped cream or whipped topping of your choice (optional), serve and enjoy! Pumpkin Cheesecake Cupcakes Recipe found on https://thissillygirlskitchen.com/pumpkin-cheesecake-cupcakes/ *All nutritional information is approximate and may not be 100% accurate. Please consult a nutritionist for more specific information.